On a sunny spring morning, William Andrew Christenberry, one of Washington’s most profound artists, settles into an upholstered armchair just inside the front door of his Cleveland Park home. He and his wife, Sandy, have lived on this quiet street for more than four decades. Raised their three kids here while he taught at the Corcoran and his photographs, paintings and sculptures of his native Alabama grew into a lifelong statement on the passing of time. His obsessive/disturbing work on the Ku Klux Klan grew into a controversial statement about the horror of racial hatred. He has done most all of that work in nearby studios or in the workspace attached to this American foursquare house, two stories with an attic-turned-office. Porches, upstairs and down. After 40 years of domestic life, chez Christenberry has an unpretentious, grandma-and-grandpa, ancestral-home vibe: the narrow kitchen, the cluttered dining room with the overstuffed bookcases and glass display cabinets, the old tin signs hung on the wall as art, the koi pond by the studio. It is front-porch Americana, not Frontgate. He is talking about the eye injury incurred when he was 14. Working as a newspaper delivery boy back home in Tuscaloosa, Ala., he snipped the metal wire that held a batch of papers. It whipped back, struck him in the right eye and destroyed the lens. The conversation is as bittersweet as it is short-lived. Christenberry is four years into a diagnosis of Alzheimer’s. A long time gone since he walked out of his light-filled studio in the adjacent lot and told Sandy that “something’s wrong.” Although his friends know, this is the family’s first public acknowledgment of the disease. There is a caretaker now, appointments with doctors, and bad days. It breaks your heart into small, soft shards, like sawdust. One of the final shows with his active participation opened this weekand runs until Aug. 1 at Logan Circle’s Hemphill Fine Arts, his longtime representatives in Washington. The show features 26 pieces, from his iconic large-format photographs of fading Southern buildings to the smaller snapshots made with his legendary Kodak Brownie. There is a sculpture and two small paintings. 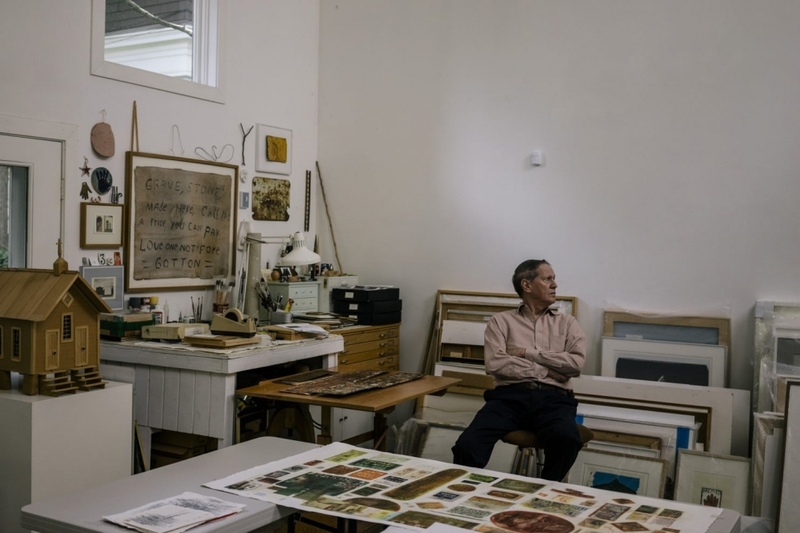 The exhibition includes his last work, “Gallery Wall,” a print that replicates the high, white north wall in his studio that is filled with old signs he pulled from roadsides back home. Christenberry’s illness is ironic, if not cruelly so. His calling card is the depiction of rural Alabama buildings sagging, falling, collapsing over years — unstated observations about our own mortality. Now the man who once wrote a book titled “Working From Memory” has so little of it left. These are some of the simple, homely structures Christenberry turned into iconic, dreamlike images. He has photographed them, painted them, made them into small sculptures. When built in three dimensions, they are on black dirt and red clay dug up from Hale County, due south of Tuscaloosa. He has taken hundreds of those cheap tin signs off trees and sides of buildings: “Prepare to Meet Thy God,” “Jesus Saves,” “Grapette Soda.” He has elevated dirt-poor graveyard memorials — crosses made from foam egg cartons (two up, one across) — into High Art. He has set up a Klan tableau of more than 100 objects, from paintings to dolls to hoods. “Klan Room” was stolen, in mysterious circumstances, from his Connecticut Avenue gallery in 1979, but he meticulously reproduced it (it’s now in storage in Kansas City). Southern in context, universal in nature, the main body of his work speaks of life, aging, wearing away. It possesses the ability to haunt. It helped shape the idea, back in the late 1960s and 1970s, that color photography could be art. Today, Christenberry’s work is in the public collections of the Smithsonian American Art Museum and the Hirshhorn Museum and Sculpture Garden in the District; the Museum of Modern Art and the Whitney Museum of American Art in New York; the J. Paul Getty Museum in Los Angeles; and on and on. Ferris — chairman of the National Endowment for the Humanities under President Bill Clinton, co-editor of the Encyclopedia of Southern Culture — is now the Joel R. Williamson eminent professor of history at the University of North Carolina. In his 2013 book “The Storied South,” he lists Christenberry as one of the region’s greatest three photographers (nevermind the man’s paintings and sculptures). Considering that the others are Walker Evans and William Eggleston — widely regarded as two of the greatest photographers of the 20th century — it’s a staggering assessment. Faulkner, Welty, Evans, Christenberry ... and here the man sits, two feet away. His slim frame, still a shade over six feet, is dressed in khakis and a dress shirt with a button-down collar. He is talking about his lifelong affection for Crimson Tide football — he grew up within sight of the stadium. Bear Bryant took over the program when Christenberry was in college, and nothing around there has been the same since. “Bear Bryant was the king of them all,” he says. “You weren’t ever an Auburn fan?” I say, gently teasing. “Who?” he says, teasing right back. Charlie, the family’s Holland lop bunny, materializes beneath the coffee table and sniffs a foot. Consider: Bill Christenberry introduced Bill Eggleston to color photography, not the other way around. They were both young turks in Memphis. Eggleston converting to color was, historically speaking, like Dylan going electric. Eggleston later had mind-blowing shows at MoMA. He dated Viva, Andy Warhol’s girlfriend and muse. An art superstar, like Jasper Johns. The Egglestons — wealthy, larger-than-life, of Memphis and Mississippi — were the polar opposites of the working-class, demure Christenberrys of Alabama. Christenberry, man, he was white, straight, drank some, not much, didn’t even dabble in weed. Who, in the ’60s, did that? Still: The two Bills and their families have been close friends for half a century, their kids growing up together. “I don’t have a closer friend in life,” Eggleston says in a telephone call from his home in Memphis. These places have been with Christenberry, always. He was born in the depths of the Depression in Tuscaloosa, a decade later than Harper Lee, about 150 miles south. Her “To Kill a Mockingbird” riveted the nation. Both attended the University of Alabama. Lee didn’t care for it. Christenberry adored it. This is out in Hale County, in Alabama’s Black Belt. It was first named for the soil, later for so many of the people who farmed it. It’s about half an hour south of Tuscaloosa, an hour east of the Mississippi line. When young Bill went out there to visit — for long stretches in the summers — it made an impression. His people knew the people pictured in “Famous” on a first-name basis. The only things in abundance out here were dirt, heat and poverty. No community was more than a thousand souls. There were graves and churches and mules and men and shacks and tenements and one-story brick buildings. In this postage stamp of a universe, as many of the tenement-dwelling, overall-clad proletariat were white as they were black. The buildings they constructed for themselves, dictated by penury, tended to sag after a few years, as if worn down by the humidity or just the weight of living. Bill, the city kid, was fastidious. Fell in love with the family vacuum cleaner. Had a good hand. Could draw anything. Parents gave him a little Brownie box camera for Christmas one year, and he put it to dedicated use. At his grandparents’, these dilapidated houses and shacks and graveyards and barns fascinated him. They looked ancient but were actually born just a few years earlier, constructed of cheap tin, unfinished wood and hard sweat. This became, by age 20, almost his life’s entire artistic focus. Like Faulkner, he never was much interested in anything but home. He drove around Hale County, the world in still-life, things jumping out at him. A graveyard became a point to which he returned year after year, painting and photographing. The door of his grandparents’ house. His uncle’s old country store, abandoned with an upside-down sign for palm readings in a shattered window. He photographed it for years, until it collapsed and was demolished. The creek where his grandfather was baptized had such a totemic effect on him that, although he would later return there time after time, he never snapped a frame of it. “I can’t make a picture of it,” he once said. He went to New York in 1961, in his mid-20s. It was a momentous time for Southern artists. Lee and Truman Capote (who summered as a child in Monroeville) were in the city, too. Tennessee Williams and Faulkner, from next door in Mississippi, had century-defining successes in their fields, as had the artist Jasper Johns, raised in South Carolina; Elvis, the singer, and Sam Gilliam, the artist, both from Tupelo, Miss. — all these small-town Southern kids, blowing up the worlds of art and literature. But once in New York, pacing the same sidewalks as Bob Dylan, Christenberry ... produced zero art. His senses overwhelmed, he worked eight jobs in 14 months, then went back South, taking a teaching gig at Memphis State. Then the artistic floodgates opened. He painted with a furious intensity. He threw paint on the canvas and pushed it around in “Fruit Stand” (1963), “Beale Street” (1964) and “Klavern 93” (1964). These were large paintings, something like two yards tall and four yards wide, filled with splotches of red and yellow and black and green, a pointing finger, hooded figures, barber poles, a blue eye — neo-Dadaist images of his surroundings. He had no sense of money. His idea of balancing the checkbook was calling his bank and asking how much was in his account. He had a studio in the old Southern Plumbing Company. He had one of the most memorable first dates of anyone in recorded history, inspired by the avant garde art trend of the time, “happenings,” a la Warhol. Christenberry was sweet on Sandy Deane, a foreign-language and history major, eight years his junior. The night of his 29th birthday, after she got off work at the Dixie Mart clothing store, he picked her up in his white Mustang, baby-blue interior. It was November. There was a party. He was wearing a bomber jacket and a white scarf. Once there, he excused himself for a moment. Then all the guests were called to stand in an alley out back. A convertible Bentley drove into the alley, top down. A man and a woman, dressed in black, rode in the front seat, wearing white masks, as did a man in the back. A toilet suddenly dropped on a rope from above, dangling over the vehicle. The man in the back stood, cut the rope, and the toilet dropped into the back seat. The car acclerated into the night. That was it. What did it mean? Who knows? Christenberry was the rope-holder on the roof; Eggleston was the mask-clad driver. The young couple became fast friends with the Egglestons. The two Bills would not become famous for several more years, but when both lived in Memphis, they liked to give each other some of their artwork. The Christenberrys moved to the District in 1968, Bill taking a teaching position at the Corcoran School of Art that he would hold for the rest of his professional life. The family grew to three children: Andrew, a furniture designer; Emlyn, an interior decorator; and Kate, who catalogues her dad’s work. Sandy raised the kids, often worked part time as an office manager and oversaw her husband’s career. By the early 1970s, Eggleston and Christenberry would have their own exhibits in museums. Like a rock thrown into the small ponds of their Southern youth, the ripples have been expanding ever since. I am holding in the palm of my right hand the original “Christmas Brownie” camera that Christenberry was given as a child. It’s nearly square, clunky, brown, heavier than you’d think. A couple of buttons and a knob. A tiny viewfinder at the back. Sandy — with that no-frills Midwest sensibility of her youth — has handed it to me, casually, from a shelf in a closet in Bill’s studio. He first used this to make studies for his paintings. Today, a single image taken by Christenberry with this camera will run you $3,000 and up. She retreats to the house, leaving me alone in the studio. Holding William Christenberry’s Brownie ... it reminds me of a job I had as a youth as stage manager for a one-man play on the life of William Faulkner. The family estate lent the show a couple of the Old Man’s things, including one of his pipes. I could sit on the stage, in the darkness after a performance, and clutch Faulkner’s own pipe between my teeth, seated among a near-perfect re-creation of his writing room. That’s pretty much the same feeling I had holding Bill Christenberry’s Brownie. The walls here in the studio go up maybe 20 feet. They are white and pristine, and natural light beams in from the skylights. The floor is spotless concrete, an air-conditioning unit hums in a corner. The walls are filled with those metal and cardboard advertising signs that Christenberry used as inspiration. Ads for Coca-Cola and Tops Snuff, the famed palmist sign itself. Everything is now being archived and catalogued, a process overseen by the couple’s younger daughter, Kate. Rows of large framed paintings, most wrapped in plastic, lean against a wall. Boxes and drawers of photographs are shelved in the middle of the room. In the far corner, there’s a worktable with an adjustable overhanging lamp. The desk is covered with bric-a-brac of the artist’s trade: pens, pencils, rubber erasers, tape, scissors, razors and stacks of pliable wood underneath. It isn’t until the end, when you’ve been looking at those photographs and taking them into account with the rest of the signs and paintings and photographs in this room, that you realize they are all part of the same thing: a love letter. To home, to times gone by, to people who cannot last. The work, the life, the hymn of William Andrew Christenberry.